We worked side by side for almost two hours, but we did not work together. From time to time, he would walk over and silently look over my shoulder to check on my sketching progress. Then he'd walk back to resume his job. Not long after arriving in Lisbon, following the Urban Sketchers Symposium in Porto, I was struck by a beautiful neon sign advertising the Solmar Café and Restaurante. It faced a busy walking street not far from where I was staying. As soon as I could, I returned to draw it—sitting in the shade, by the front door of a theatre (the Theatro Politeama). As I drew, a recording of boisterous songs from the current production blared from speakers over head, filling the street with Portuguese and Brazilian show tunes. It sounded like a soundtrack for the retro sign, actually. 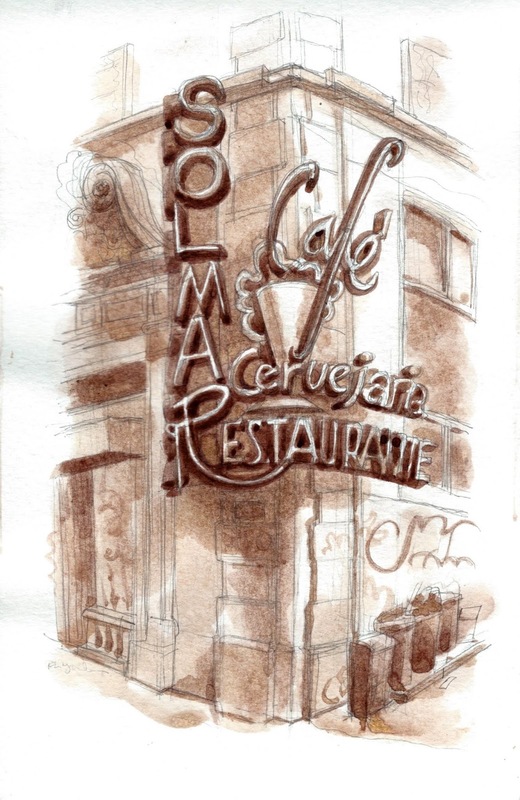 Although the street was very active, the Solmar sits empty now. The only information (in English) on the internet is a collection of bad reviews of a restaurant long past its prime. Below the jazzy letters sits a row of trash cans and graffiti. The unlit neon now promotes the past. As I worked, by my side was a young man dishing out handbills. He greeted everyone with a big smile and a thin yellow piece of paper with directions in four languages to "O Sitar Restaurante Indiano Tandoori—Finest Indian Cuisine." The restaurant was not nearby and I was surprised by how many people took the paper with appreciation. I wonder how well the advertising worked. When I was packing up, the young man came over to see my finished drawing and smiled. I gave him one one of my postcards which I use to promote my work. I asked for one of his handbills. He seemed surprised and handed one over. Then we exchanged "obrigados" (thank yous) and goodbyes.